Her story is a phenomenon. Her life is a disaster. 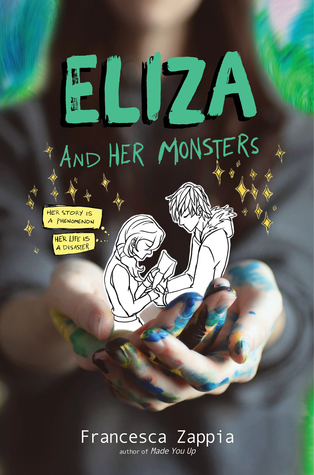 In the real world, Eliza Mirk is shy, weird, and friendless. Online, she’s LadyConstellation, the anonymous creator of the wildly popular webcomic Monstrous Sea. Eliza can’t imagine enjoying the real world as much as she loves the online one, and she has no desire to try. Then Wallace Warland, Monstrous Sea’s biggest fanfiction writer, transfers to her school. Wallace thinks Eliza is just another fan, and as he draws her out of her shell, she begins to wonder if a life offline might be worthwhile. But when Eliza’s secret is accidentally shared with the world, everything she’s built—her story, her relationship with Wallace, and even her sanity—begins to fall apart. Anyway, deze boeken zijn al binnen, dus deze kan ik jullie laten zien! Enjoy.